Fairies in Zelda games are always a bonus, and ever since being able capture them for later use in A Link to the Past, fairies have proven to be a valuable resource in desperate times. However, catching things that move in sporadic patterns right before a difficult boss isn’t always the easiest task. 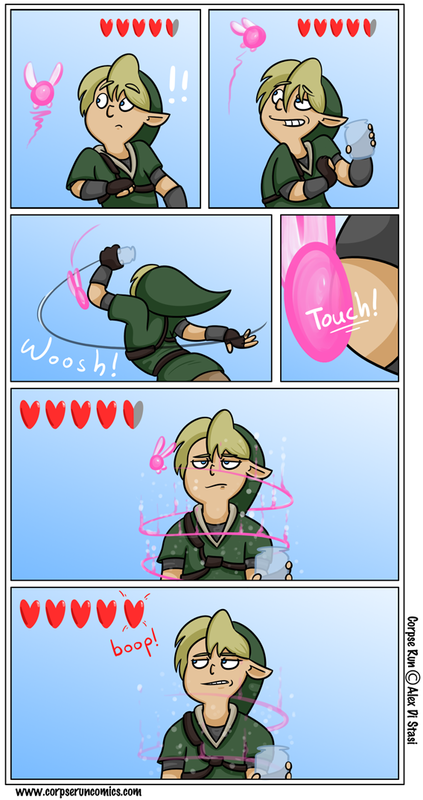 Especially when you’re just waving around a glass bottle, like in Ocarina of Time. And sometimes you give the fairy just a touch. Hit the jump to read the comic! Not exactly what he was hoping for. Hopefully the upcoming boss isn’t difficult. In A Link to the Past, fairies weren’t readily available right before a boss, but at least when you found the fairy fountains (like the one right by your house! ), they were easy to catch with the net. 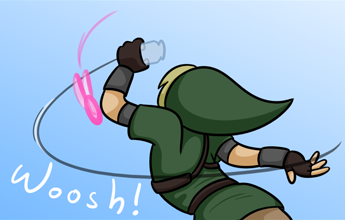 Ocarina of Time’s straight to the bottle system is more fun because you can use it to fight Ganondorf, but it’s less convenient for catching fairies. And I know we’ve all experienced what happened in the comic.